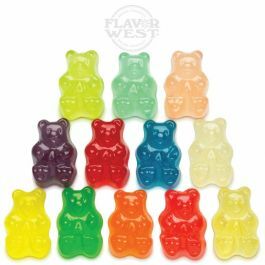 A yummy fruity gummy bear flavor that bursts your taste buds with it richness. Enjoy the mouthwatering unique flavoring in your favorite creation. Type: Gummy Bear Water Soluble Flavoring. Ingredients: Natural and Artificial Flavoring, Propylene Glycol. USP Kosher Grade Flavoring. Usage Rate: 15-20% for E-use. Flavor Suitability: Drinks and beverages, smoothie, desserts, pastries, baked treats and more. Specific Gravity: 1.12 No Refunds on Flavoring. Awesome flavor when I am in the mood for my candy vapes-- FW never lets me down---realistic flavor and just plain yummy.